The past week and a half has been chockfull of artists and critics debating the importance of playing live and the state of dance music, washing out some cool smaller stories that went under the radar. We’re taking a few minutes today to highlight three interesting MIDI-based projects – a Mexican jacket that sends MIDI notes, an incredible controller design app, and an update to a Midi Fighter-like product that we highlighted nearly a year ago. Why not wear your MIDI controller on you while you’re walking around? We can think of a few reasons, but it doesn’t make Mexico-based MACHINA‘s Midi Jacket any less of an interesting concept. 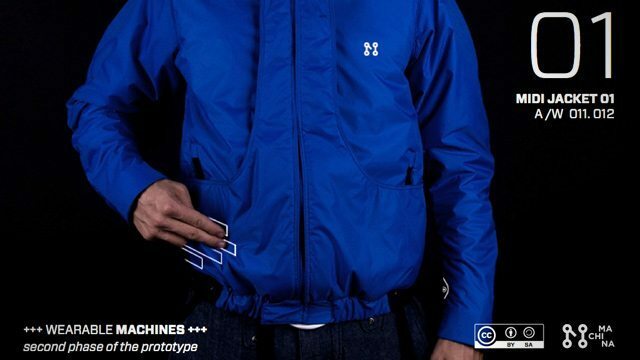 With three touch strip sensors on the exterior of the jacket, as well as an accelerometer and “flex sensors” in the sleeve, we could easily see this project being complemented with an iOS application that allows the user to jam out while walking around town, manipulating beats and effects while staying warm. Check out the clothing design company’s promotional video for the jacket below, featuring performing musician Moi and a fair amount of anti-Internet censorship messages. The jacket is “coming soon”, pricing unknown, – and the one featured in the video is supposedly one of five models. After watching the demo, we’re not sure that the accelerometer and bend detection actually offer any level of intuitive control yet- but often it’s hard to tell simply based on a short clip like this.